Heinz Zemanek (1 January 1920 – 16 July 2014) was an Austrian computer pioneer who led the development, from 1954 to 1958, of one of the first complete transistorised computers on the European continent. The computer was nicknamed Mailüfterl — German for "May breeze" — in reference to Whirlwind, a computer developed at MIT between 1945 and 1951. Heinz Zemanek went to a secondary school in Vienna and earned his Matura in 1937. He then started to study at the University of Vienna. In 1940, Zemanek was drafted into the Wehrmacht, where he served in a "communication unit" and also as a teacher in an Intelligence Service School. Returning to studying radar technology he earned his Diplom in 1944 with the help of University of Stuttgart professor Richard Feldtkeller (1901–1981). After the war Zemanek worked as an assistant at the university and earned his PhD in 1951 about timesharing methods in multiplex telegraphy. In 1952 he completed the URR1 (Universal Relais Rechner 1, i.e., Universal Relay Computer 1). He died at the age of 94 on 16 July 2014. The IBM Laboratory Vienna, also known as the Vienna Lab, was founded in 1961 as a department of the IBM Laboratory in Böblingen, Germany, with Professor Zemanek as its first manager. Zemanek remained with the Vienna Lab until 1976, when he was appointed an IBM Fellow. 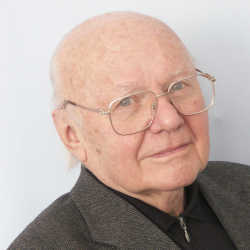 He was crucial in the creation of the formal definition of the programming language PL/I. For several years, Zemanek had been a lecturer at the Vienna University of Technology, which features a lecture hall named in his honor. He was also a long-time member of the International Federation for Information Processing, of which he was president from 1971 to 1974. Professor Zemanek joined the Boy Scouts in 1932 and served as Scout Leader, International Secretary of Austria from 1946–1949 and International Commissioner of the Pfadfinder Österreichs from 1949–1954. ^ Jones, Cliff B. (2015). "In memoriam: Professor Heinz Zemanek (1920–2014)". Formal Aspects of Computing. 27 (2): 237. doi:10.1007/s00165-015-0332-4. ^ "Austrian computing pioneer Heinz Zemanek dead at 94". 17 July 2014. Retrieved 17 July 2014. ^ "Morto Heinz Zemanek, disegno' il primo computer nel 1955". Internazionale. 17 July 2014. Retrieved 17 July 2014. ^ "A Formal Definition of a PL/1 Subset" was produced as TR 25.139 on 20 December 1974. The five authors of the report were Hans Bekič, Dines Bjørner, Wolfgang Henhapl, Cliff B. Jones, and Peter Lucas. See LNCS 177, Jones, 1984. p.107–155. ^ "Heinz Zemanek – Biography". Austrian Computer Society. Retrieved 9 April 2016. ^ "Reply to a parliamentary question" (PDF) (in German). p. 1707. Retrieved 24 November 2012. ^ "Members". European Academy of Sciences and Arts. Retrieved 4 January 2018. ^ "The Eduard Rhein Ring of Honor Recipients". Eduard Rhein Foundation. Archived from the original on July 18, 2011. Retrieved February 5, 2011. ^ "Ring of Honor 1998 – Prof. Dr. Dr.h.c. mult. Heinz Zemanek". Eduard Rhein Foundation. Archived from the original on July 18, 2011. Retrieved February 5, 2011. Cliff B. Jones, ed. (1984). Programming Languages and Their Definition — H. Bekič (1936-1982). Lecture Notes in Computer Science. 177. Berlin, Heidelberg, New York, Tokyo: Springer-Verlag. doi:10.1007/BFb0048933. ISBN 978-3-540-13378-0. Zemanek, Heinz (1985). "About the architecture of my life". In Neuhold, E.J. ; Chroust, G. (eds.). Proceedings of the IFIP TC2 Working Conference on The Role of Abstract Models in Information Processing. Amsterdam, New York, Oxford: North-Holland. pp. 1–28. ISBN 978-0-444-87888-5. Bandat, K. (1985). "Heinz Zemanek and the IBM Laboratory Vienna". In Neuhold, E.J. ; Chroust, G. (eds.). Proceedings of the IFIP TC2 Working Conference on The Role of Abstract Models in Information Processing. Amsterdam, New York, Oxford: North-Holland. pp. 53–59. ISBN 978-0-444-87888-5. Oral history interview with Heinz Zemanek, Charles Babbage Institute, University of Minnesota. Zemanek discusses his engineering education and work in radar technology during World War II. Zemanek then focuses on the development of computers in Austria: magnetic drums and magnetic memory, the Mailüfterl computer, LOGALGOL and other compilers, the University of Vienna, where Zemanek worked on his computer, the subsequent sponsorship of the project by International Business Machines Europe, and ALGOL and PL/I language standards development. This page was last edited on 5 February 2019, at 03:53 (UTC).